Our 26 acre lakefront facility is surrounded by thousands of acres of National Forest. While we are remote, access is easy on well paved and maintained roads. 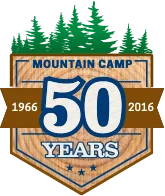 Mountain Camp operates under a Special Use Permit from the U.S.D.A. Forest Service and, although we do not own Ice House Lake, we are the only buildings near the shore and there is very little public use of the lake. We have our own well for water, generators for power and satellites for internet and communications. Our camp is rustic and simple so as not to take away from the natural beauty of our setting, but all of our cabins and main buildings have been recently renovated. 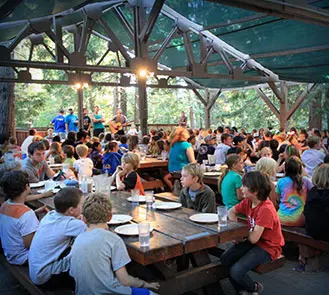 Our facilities include the historic main lodge, more than 22 camper cabins, 3 large shower houses, sand volleyball and basketball courts, sports fields, challenge ropes course, private waterfront area, covered open air dining hall, camp store, infirmary, campfire stage, archery range, camp offices and much more. Campers stay in open air cabins that house 10 to 14 campers in wooden bunk beds. There are no dressers or closets in the cabins. Campers keep their clothes and belongings in trunks or luggage that slides under their bunks. Cabins do not have bathrooms but they do have electricity and shower houses with bathrooms located nearby.